brand or corporation. 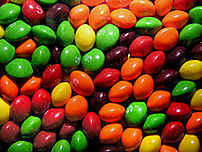 Mars tried this with Skittles versus anyone of their other brands. This was a test of the market, and by any measurement it could have been a sheer success. We unfortunately don’t have the honor of knowing which element they were looking to test. On a global level…brand awareness/visibility and brand engagement are the central themes that can be measured. Those two areas also present a starting point for any non-profit. Sure any non-profit can do a quick constituent survey to find out what people close to them feel/view about the organization… but for those with a larger than community-based reach, or those looking to gain traction…why not think outside the survey box and find a way to gauge a larger base. Often times people are either not aware of an organization at all, or are unsure of exactly what the organization does, and what it could mean to them. This type of social experiment helps create that understand and potentially rally more people around an organization’s cause (see brand awareness & engagement). I will throw in the disclaimer that a campaign such as the Skittles campaign does take some time and labor (something many organizations won’t have the resources to dedicate to)…but again, this type of “out of the box” thinking can stir a small scale social experiment easily manageable by the smallest of non-profits. Originally posted as a comment by Nishland on Kintera Think Tank using Disqus.